Go to the wanted board in your ranch or city and look for a wanted poster. Look at the bill and if it's to your liking, accept the bounty. Once you get to the gang hideout, take the boss alive for more money and fame, or just kill him and bring back evidence of his death. If you decide to take him alive, you have to tie him up with rope and ride him into town. 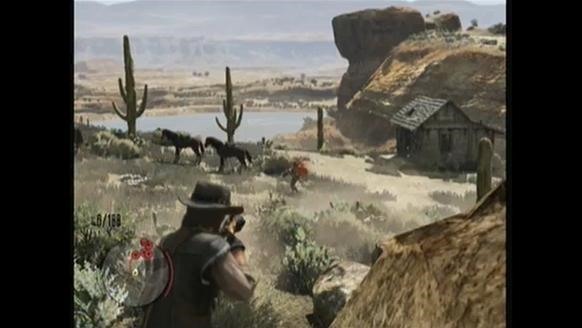 During this entire time there will be an endless amount of bandits chasing you. Here is a typical bounty hunt, edited down to the random occurrences and fights. This hunt lasted seventeen minutes, but edited it's only a few. 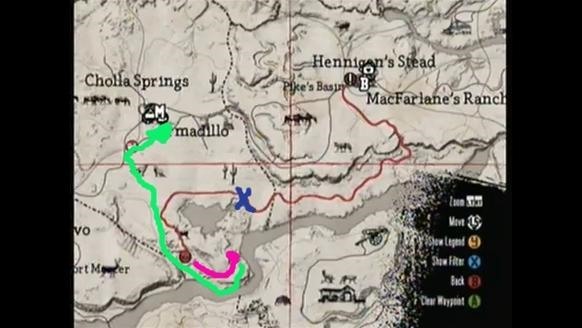 The red is the path to get to the hideout. The X on the red path is the random event: setup by the road. Purple is the path taken to overtake and bring down their leader. Green is the path taken to town. The setup by the road is classic. This is a random occurrence that appears anywhere, anytime in the game. The bait, a woman in distress, calls for your help. When you get near enough four gunmen appear and try to kill you. Luckily I've seen this before so I was ready. If you're wondering why the woman died, it was because her eyeliner rubbed me the wrong way. The only thing that could make this better is if there was an ability to set things on fire. I would then bound and gag all of them, stick them in the carriage, and set that on fire while I push it down a cliff. A gamer can dream. The fight at the hideout can go several ways. You can run in and kill everyone very fast, but that doesn't get you the most fame or rewards. In the video I made sure to take out all the lackeys before approaching the boss. One did surprise me when he got back up behind me, I almost died. Also, I forgot all about the art of crotch shots. Expect lots of them in future videos, they are much better than those sissy head shots shown here. Once the boss was the only one left, I shot his leg to stop him from galloping away but it wasn't enough. If you go for the kill you don't have to worry about this, but to take them alive, most of the time there is a long horse chase. Running back to town with the bounty is hard. 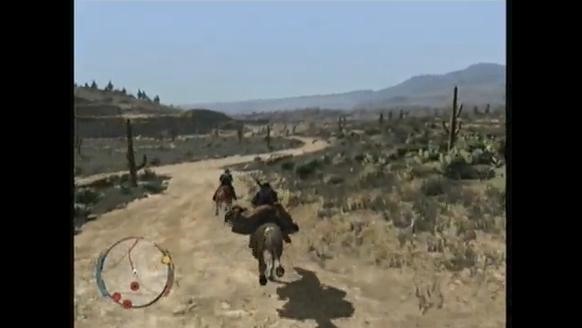 Bandits keep coming at you in groups of three endlessly until you reach town. On my first bounty I must have killed thirty of them before understanding that they were never going to end. 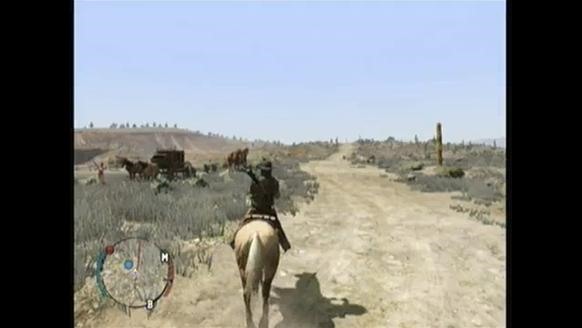 Bandits are able to damage your horse and your bounty, so don't assume things are well just because they are not hitting you.To take the bandits out, I waited until they were near (they have faster horses), and then came to an abrupt stop, forcing them to quickly pass me with their momentum. I pull out my gun and take them out, it's a simple strategy that's worked well. Overall bounty hunts are fun. They take time and there are so many variables that a victory is not always guaranteed. Personally I like to trot to the location, taking in the scenery instead of rushing in. Taking the boss alive is also a lot of fun. There is a lot more strategy in not killing him and then trying to escape his goons. There is a set number of bounties though, I would have liked for them to be infinite with randomly generated targets, oh well. Walked upon a guy examining a dead guy. Just like LA! Could not save someone from a hanging. Not in the video but the chase for the main boss lasted five minutes. I literally ran across the map to get him. That's the hardest I've chased after a man, don't tell my wife. Thrown off my horse in the middle of a chase. I hate this horse.